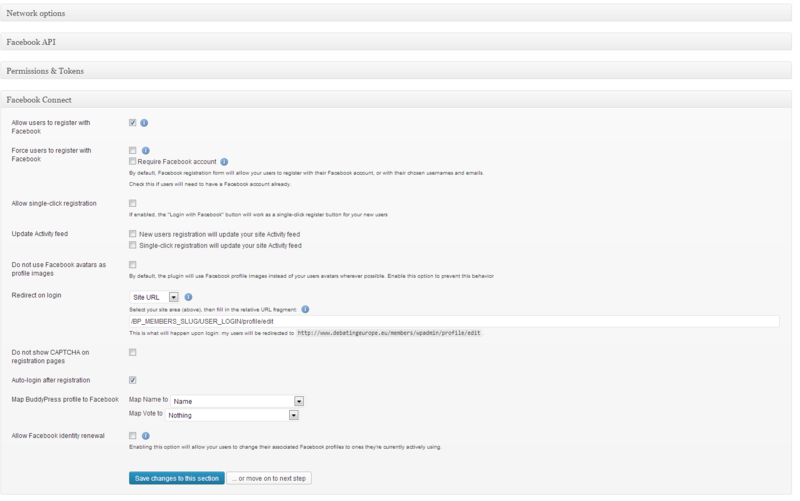 I'm running Ultimate Facebook 2.6.2, WordPress 3.5.1 (with multisite) and BuddyPress 1.6.4. The problem is that when "Login with Facebook" is clicked, it loads for a couple of seconds and then redirects to a 404 at http://SITEURL/members//profile/edit (i.e. the "USER_LOGIN" macro is coming up with a blank). No user is being created in the database. I have tried disabling Ultimate Facebook and testing other Facebook Connect plugins (principally Nextend Facebook Connect), and they are successfully creating users in the database, but they have other problems with the redirect that make me prefer Ultimate Facebook. Any ideas? Please let me know if there's anything I need to send you (including dashboard access) that might help you. can you try using the default 2012 theme? have you granted extended permissions? network dashboard > facebook settings > permissions & tokens. you should see a link to click that says create extended permissions if you haven't already. you can also refresh the user access token. I switched to 2012, but no joy. I also deactivated all plugins except Ultimate Facebook, but the problem was still there. I have granted extended permissions to the plugin. Is there anything I can do to help? I'm having problems even with the default theme and no plugins. I'm working against a deadline and this one has me stumped. I'm going to ping V on this, see if he can give some feedback, I am unable to replicate it. though I was having some problems when sandbox mode was enabled on the app in facebook. turning sandbox mode fixed the issue. kept saying API key was invalid, but I'm not sure that's related to this issue. I will wait to see what Vladislav suggests. P.S. There's also nothing in the error log. Thank you very much for the settings screenshot. Can you please tick your "Allow single-click registration" checkbox, so it's checked and save your settings? Without this setting enabled, the login button will attempt to log your user in but won't create a new user if he or she doesn't already have an account on your site. Apologies, I should have checked out the settings in greater detail! The plugin is now correctly creating users in the database, so that problem is resolved. However, the USER_LOGIN macro is still serving a blank URL instead of the username of the current user. Any ideas what might be causing it? Let me know if there's anything I can send you! Any news? Is there anything I can send you that might help? I'm sorry for the delay - just to make sure, is it just the USER_LOGIN macro that's refusing to expand to a meaningful value? Have you perhaps tried other ones? Also, is it not expanding at all (i.e. you can literally see USER_LOGIN in the URL), or does it get expanded to a wrong or empty value? Other macros are working properly (BP_MEMBERS_SLUG, for example, is pulling the correct path). The USER_LOGIN macro is returning an empty value.